Delicate, sweet-flavored fennel bulb is one of routinely found vegetable ingredients featuring in the Mediterranean cuisine. Its succulent enlarged bulb imparts unique “anise-like" sweet flavor to the recipes. Bulb fennel is cultivated for its beautiful, squatted stems in many regions of the southern Europe, especially in Italy. 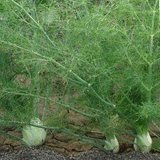 It is also known as Florence fennel, finocchio, and sweet fennel. Fennel is a member of the Apiaceae (parsley family) and is related to carrots, caraway, anise, cumin, dill, etc. Scientific name: Foeniculum vulgare var. azoricum. Bulb fennel (F. vulgare var. azoricum). Close-up view. Bulb fennel is a cool season perennial herb but grown as an annual vegetable crop. Unlike seed fennel, bulb fennel is a small herb reaching just up to 2 feet in height. As the plant grows further, its thick lower leaves overlap in layers to form a swollen, bulb-like structure just above the soil surface. At maturity, its bulb measures about 3-5 inches in width and about 3 inches in length. As the plant begins to develop the bulb, farmers often pull surrounding soil to create a mound around the stem to obtain long blanched fronds. Bulb fennel is one of the very low-calorie vegetables. 100 g bulb carries just 31 calories. Further, it contains generous amounts of fiber (3.1 g/100 g or 8% of RDI) but little fat, and zero cholesterol. The fresh bulb gives off sweet anise-like flavor. Much of this comes from the aromatic essential oils like anethole, estragole, and fenchone (fenchyl acetate) in the fennel. Anethole has been found to have anti-fungal, and anti-bacterial properties. Also, fennel bulb contains moderate levels of the water soluble vitamin, vitamin-C. 100 g of fresh bulbs provide 12 mg, or 20% of vitamin-C. Vitamin-C helps the human body develop resistance against infectious agents and scavenge harmful, pro-inflammatory free radicals. Further, it has small amounts of vitamin-A. The bulbs have an excellent level of heart-friendly electrolyte, potassium. 100 g provides 414 mg or 9% of daily-recommended levels. Potassium is an essential electrolyte inside the cell. It helps reduce blood pressure and rate of heartbeats by countering effects of sodium. Fennel also contains small amounts of minerals such as copper, iron, calcium, magnesium, manganese, zinc, and selenium. Fresh bulb-fennels can be readily available in the local farmer markets in early autumn or spring seasons. However, they also sold most of the year round, especially in the super markets. In the United States, bulb fennels labeled as "sweet-anise" in the markets, because of their anise-like flavor. To harvest, firmly hold at its bulb base and gently pull the whole plant off the ground. Trim roots and cut off its top green leafy stems since they rob nutrients off fennel frond. In the stores, choose tender pearly white fennel bulbs that are compact, heavy in hand, and attractive anise-like sweet flavor. Buy medium-sized bulbs each weighing about 5-10 ounces. Gigantic and over-mature bulbs are quite stringy and have a less intense flavor. Avoid dried out, shriveled bulbs and those with yellow discoloration, spots, splits, and bruise. At home, place them in a zip pouch (plastic bag) and store inside the vegetable compartment of the refrigerator as you do in case of leeks. They stay fresh for up to five days, however, prolong storage would lead to loss of nutrients and some flavor. Fennel bulb is used as a vegetable to add flavors to various dishes, particularly in salads, stews, and soups. Its blanched bulb has a unique aroma and light, sweet, subtle licorice taste. Sweet fennel is one of the favorite winter season vegetables in the whole of France and Italy. To prepare, trim off the base as in onions. Cut away top leafy stalks just above the bulb. Remove tough outer one or two layers as they are stringy and unappetizing or use them to prepare the vegetable stock. Then, its clear white frond may be cut into cubes, sticks, or slices as one may desire to add in the recipes. Photo courtesy: Jon Juan Crab risotto, fennel and herb dish. Thinly sliced raw finocchio is eaten alone, served with a dip, or added to vegetable salads ((Insalata di Finocchi)). It can be steamed, braised, or sautéed, and added to a variety of dishes. Fenecchijdde is a popular Christmas-Eve soup in Apulia region of southern Italy. Fennel bulb can be added to flavor meat, fish, pork, and poultry recipes. <<-Back to Vegetables from Fennel bulb. Visit here for an impressive list of vegetables with complete illustrations of their nutrition facts and health benefits.